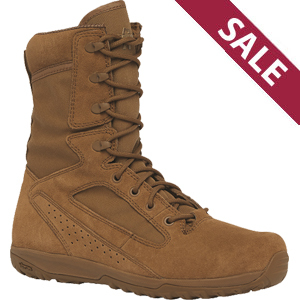 These Transition series boots were designed for the soldier transitioning from conventional to minimalist footwear for the first time. MiniMil Transition boots are modified in a way (they�ve got 6mm heel drop and a rather thin midsole) so that to allow you to get a feel of the terrain you are walking on but stay protected from the elements at the same time. Another important feature of the model is that it actually teaches you to walk by putting your whole foot flat on the ground in order to be more stable when trekking. The boots are 8in height, highly breathable; they�ve got padded Achilles support and double and triple stitched seams. Furthermore, they are made of high quality oil and slippery-resistant rubber with abrasion resistant nylon and leather upper. All in all, the MiniMil model train you to use new muscles in your feet and legs so that to protect and train your body at the same time.